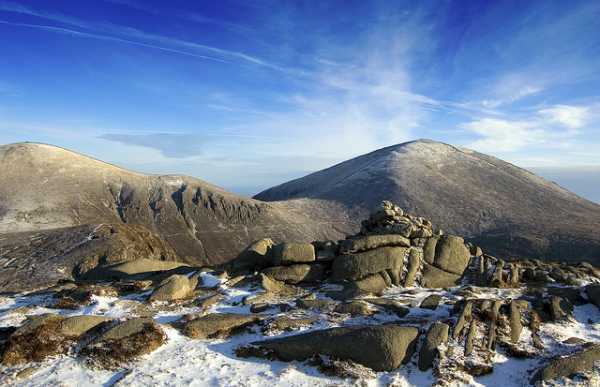 I completed all the Mourne 2,000 footers on Monday last by taking in Chimney Rock and Cove on a superb winter's morning. Having climbed Chimney Rock from the pretty dull path leading from Bloody Bridge, I crossed over to Cove via the Bog of Donard and the Brandy Pad. The route offered superb walking with a heavy frost leaving the crossing of the bog a less challenging task that usual. I veered off the Brandy Pad at the large cairn below Slieve Beg and headed up Beg before crossing over to Cove. Although only a half kilometre from Beg, the climb up Cove is over very steep ground.